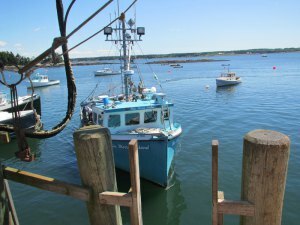 Georgetown is an island town located in the Midcoast region of Maine, and included in the five islands of Georgetown, Bay Point, Marrtown, West Georgetown, and Robinhood. Reid State Park is located in Georegetown. This is Maine’s first State-owned Saltwater Beach. The park was a gift from Walter E. Reid, a prosperous businessman and Georgetown resident. It is a popular summer tourist destination, and also an attraction to artists and bird watchers. The Mooring B&B is the perfect romantic getaway with intimate rooms, panoramic ocean views and strolling gardens. To share any Georgetown, Maine information with us, contact us. Five unique rooms, all with private baths, great ocean views & beautiful gardens. A roomy casual porch catches the warm summer breezes. The Mooring has beautifully landscaped grounds with a Pergola directly on the ocean edge to host a wedding. Enjoy the large groomed lawn to have your tented reception, family reunions, or afternnon stroll. Discover a beautiful, quiet spot on the ocean. To send e-mail to the Assistant to the Selectmen, use gtwnme@hotmail.com.